Adopt direct wide slot user-friendly design, suitable for different specifications of the installation. Compatible with any action cameras that uses a for GoPro mount bracket. The elastic head light clamp can hold most type of flash lights. 1.WIDE SLOT DESIGN: This handlebar extension bracket adopt direct wide slot user-friendly design, suitable for different specifications of the installation. 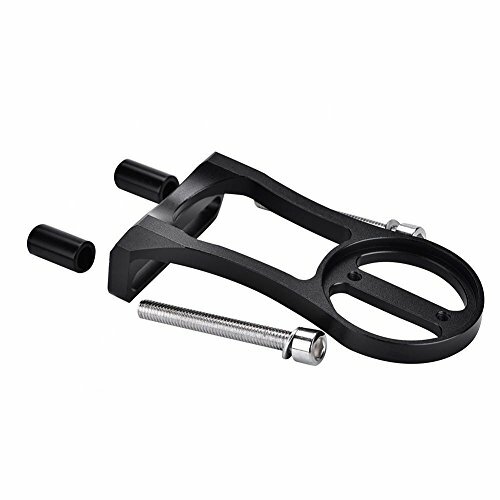 2.MULTIPLE FUNCTION: The multi-function bicycle stem bracket can hold for GoPro action camera, for Garmin edge GPS computers and flashlight. 3.PORTABLE AND LIGHTWEIGHT: Compact, lightweight and multifunction with stylish design, easy to carry and use. 4.APPLICABLE MODEL: Fits all for Garmin Edge GPS computer series 25 200 500 510 520 800 810 1000. Fits for Bryton:20,30,210,100,310,330,530. Fits for Cateye:CC-GL10,CC-GL50,CC-PD100,CC-MC200W,CC-PA100W,CC-COM10W,CC-VT210W,CC-RD300W,CC-RD310W,CC-RD400W,CC-RD410W,CC-RD420W,CC-RD430W. 5.GUARANTEE: If you are not satisfied with our product you received, you can send emails to us at any time. We will reply you instantly and help you solve your problem. * Please allow minor error due to manual measurement. * The colors may be a little difference for the different monitor display. WIDE SLOT DESIGN: This handlebar extension bracket adopt direct wide slot user-friendly design, suitable for different specifications of the installation. MULTIPLE FUNCTION: The multi-function bicycle stem bracket can hold for GoPro action camera, for Garmin edge GPS computers and flashlight. PORTABLE AND LIGHTWEIGHT: Compact, lightweight and multifunction with stylish design, easy to carry and use. APPLICABLE MODEL: Fits all for Garmin Edge GPS computer series 25 200 500 510 520 800 810 1000. Fits for Bryton:20,30,210,100,310,330,530. Fits for Cateye:CC-GL10,CC-GL50,CC-PD100,CC-MC200W,CC-PA100W,CC-COM10W,CC-VT210W,CC-RD300W,CC-RD310W,CC-RD400W,CC-RD410W,CC-RD420W,CC-RD430W. GUARANTEE: If you are not satisfied with our product you received, you can send emails to us at any time. We will reply you instantly and help you solve your problem.